I’m sure you all know by now that I love, love, love nail polish, but I actually don’t have a huge collection. I have two of these acrylic spice racks that I keep all of my polishes on. They are great quality racks, fit well in my linen closet and are super affordable (under $10!) So, as I was saying, try to keep my collection on the more reasonable side, I almost always finish the bottles and I only purchase colors that I know I will wear a lot. I think I have mentioned that I also like to change my polish about 2-3 times a week, it’s become a habit now and something I quite enjoy. I also find myself wearing more neutral colors during the work week and for weekends, I tend to wear brighter colors. 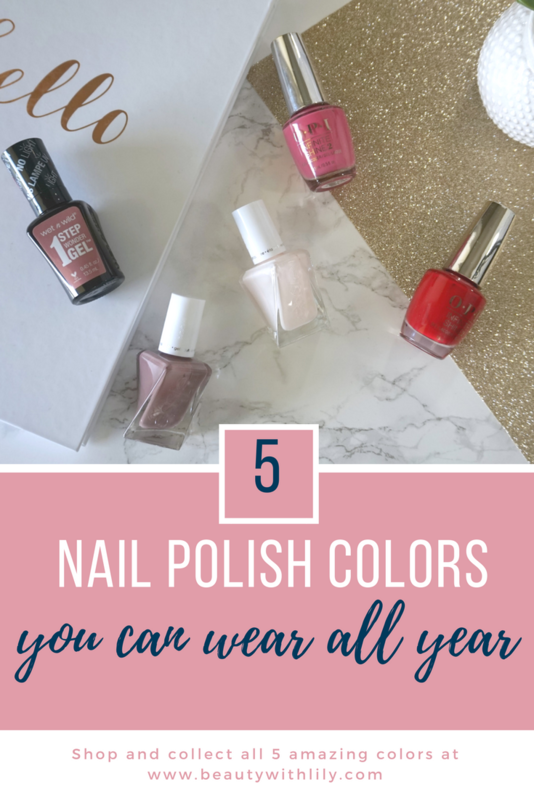 So today I’m sharing 5 of my favorite year-round polishes. These are colors that can be worn throughout all seasons and still look good. Essie Gel Couture in Pre-Show Jitters – I have tried many white nail polishes and finally fell in love with this one. The color is perfect, no too white but white enough — if that makes any sense!? It can be streaky on it’s own but I always use a base coat and have no problems. The picture above shows it without a base or top coat and 2 layers. Essie Gel Couture in Take Me To Thread – If you’ve been with me for a long time than you more than likely know that I am obsessed with Essie’s Merino Cool, but since this new line of Gel polishes came out from Essie, I haven’t picked up the regular formula polishes in awhile. So it’s safe to say that this is my new love. It’s the perfect color! The picture shows it without a base or top coat and 2 layers. OPI Infinite Shine 2 in Big Apple Red – I love OPI polishes and have completely fallen in love with this line as well. If you are looking for a classic red that can be worn all year long, than this is the polish for you. The picture above is shown without a base or top coat and only 1 layer. OPI Infinite Shine 2 in Defy Explanation – This is the best pink color to wear throughout all seasons — it’s not a bubblegum pink and it’s not too in your face either. The picture above is shown without a base or top coat and only 1 layer. WNW Wonder Gel in Stay Classy – This line of nail polishes is incredibly affordable, under $5 a bottle and such good quality. They have a nice variety of colors in the line but my all time favorite has to be this one. It’s the perfect mauve-y neutral color. The picture above is shown without a base or top coat and only 2 layer. 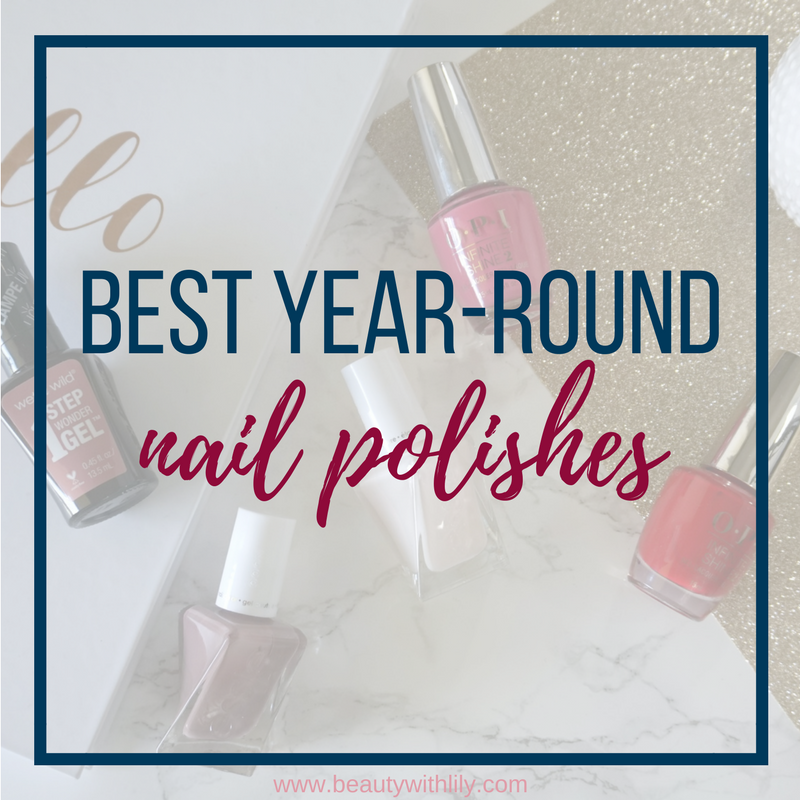 Now, I’d love to know what your favorite year-round polishes are? Liked this post? Share the picture below on Pinterest!